Stephanie and I have spent a few days in the hospital, and she seems to have been progressing better than she has after previous surgeries. When they rolled her out of the post-op area, she was already sipping water. In prior surgeries, she wasn’t even allowed to touch but a few ice chips for about a day afterwards. Aside from a furious bout with itchiness last night (which we think was brought on by the hospital bedsheets, soon replaced by soft sheets from home), Stephanie has been able to do everything they want her to in order to go home. But, as we have learned on multiple occasions during this journey, life can be unpredictable. I noted in the last post that they had to check the removed ovary for microscopic traces of the cancer. Well, the pathology report came back today and MJ gave us the news: there were microscopic cancer cells in the cystic walls of Stephanie’s ovary, nothing that could be seen with the human eye. That’s the thing with this or any other type of cancer. There’s an obvious battle against tumors and what shows up on scans, but there is also the microscopic battle. So, there will be further treatment. 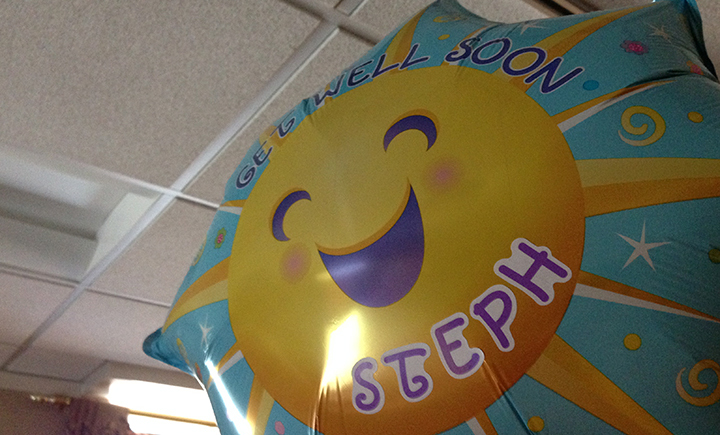 Stephanie will once again have to undergo chemotherapy treatments after all. She’ll start in a couple weeks after she heals up from her hospital stay. The good news is that these cells were found in the ovary that was taken out. There wasn’t a tumor, and there wasn’t any spreading to other areas of her body. So this chemo season will be an “insurance policy” to fight the microscopic battle. MJ is confident that it’s nowhere else and if there are still cancerous cells, the chemotherapy will prove effective against them. And, tomorrow morning, Stephanie is getting a PET scan, not a CT scan. That is good news. In hindsight, we were a little spoiled with the immediate post-surgery news that no cancer was seen. Just because it wasn’t seen doesn’t mean that it still wasn’t present (obviously). It’s so small that the doctor who sees cancer every day couldn’t even see it. But we know that God is still good. He has orchestrated this whole story. Nothing about this is a surprise to Him. He is obviously still working in this story to bring glory to Him. 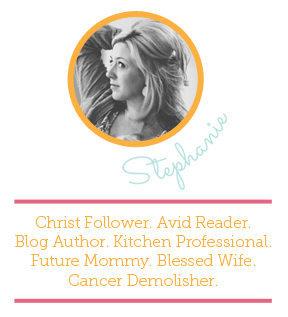 Yes, it’s a bummer that Stephanie will lose her hair again and have to get chemo again. But, this is what we were planning before we even got to the hospital on Monday. We were prepared for another season of treatment and we still are. Prayer-wise, we would appreciate prayers for emotional strength and endurance for the season ahead. Imagine the amount of stress and anxiety that is endured when you spend months and months growing your hair out just to find out you’re going to lose it again. This is difficult (especially for a woman). Just like everyone else, we have been expecting to be able to plan out our lives a little bit. Some people get further along than others before God reveals HIS plan for their lives. We are experiencing this in the time when we would otherwise be thinking about buying our first house and starting a family. Having to put those things “on hold” has been difficult for both of us, so prayers for understanding God’s will for our lives and being able to handle the “holding” gracefully would be especially appreciated. Also, very short-term, I am bouncing between home and the hospital not only to care for our pups, but it is moving week. So, we also request prayers for a smooth move. Big props to the fellas who will be helping us out this weekend with this task, it means more than you know. We are praying that the “third time’s a charm” with this treatment. We’re keeping positive attitudes and we know that how people handle what comes their way reveals their true character. Thank you for praying with us and standing beside us. your faith and your honestly shines and it ministers to us all. God bless and keep you both in His tender care. Praying for you both and believing for complete Victory through Christ Jesus!